DODGE CITY, Kan. – Elliot Jacoby is a two-time Wrangler National Finals Rodeo qualifier trying to make it to the City of Lights for the third time in his career. That’s a difficult task, given that only the top 15 in the world standings in each earn the right to compete in Las Vegas in December. 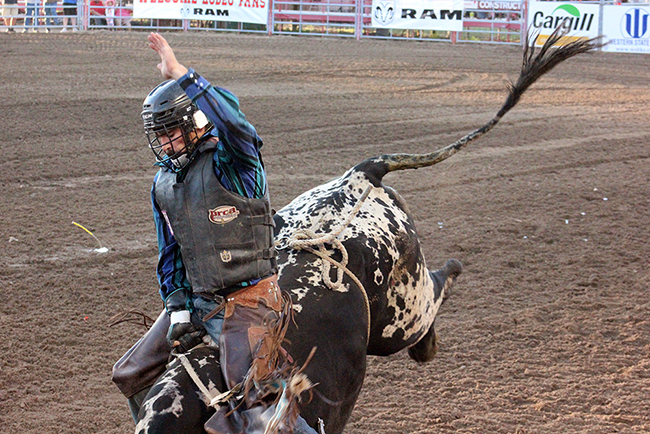 But Jacoby gave himself a good shot at it Tuesday night during the Dodge City Xtreme Bulls event at Roundup Arena. He matched moves with JK Rodeo’s Zorro for 90 points to win the title, edging 2011 world champion Shane Proctor by one point. For that, Jacoby pocketed $4,907 and moved up two spots to 15th in the world standings with $61,547. “Confidence is probably one of the main ingredients in bull riding,” he said. “If you can stay one a good bull one day, it can carry over to the next day. It keeps you more positive and lets you go at those bulls with everything you have. He knows a little bit about that. Jacoby qualified for the NFR in 2013-14, finishing as high as eighth in the world standings. He knows staying in the 15th spot at the end of the regular season would get him back to Sin City, but he’d prefer to move up several more places in the standings and secure his venture by the end of September. That would certainly keep Jacoby heading up the standings, and that’s what Schell Apple did in the Bullfighters Only event. Apple man earned the Dodge City title with an 81-point fight from a Rockin’ B & Magnifica bull to upend. Apple took the lion’s share of the prize money, outscoring two men in the top 10: No. 6 man Beau Schueth and the third-ranked bullfighter, Weston Rutkowski, the two-time defending world champion. Both Schueth and Rutkowski finished with 77. “I’m just really thankful I was able to put my talents and hard work in and get the win,” he said. 1. Elliot Jacoby, 90 points on JK Rodeo’s Zorro, $4,907; 2. Shane Proctor, 89, $3,762; 3. Boudreaux Campbell, 88.5, $2,781; 4. Dustin Boquet, 87, $1,799; 5. Eli Vastbinder, 86.5, $1,145; 6. Tyler Hessman, 85.5, $818; 7. (tie) Aaron Williams and Jeston Mead, 85, $572.